Style and convenience in a chair. Stack seating enhances your style when in use and is easily stored for extra space. Far from being solely functional, stacking chairs can also offer a sense of style to any event. Shop our wide selection of stackable chairs to find the perfect seating solutions for all kinds of commercial and residential occasions. Chiavari chairs are the favorite for weddings and special events. Whether you are looking for wood, resin, metal or ghost chairs, our chiavari chairs offer the timeless elegance for any upscale event. Shop our most popular styles here. Banquet chairs are perfect for any assembly, conference center, wedding venue or special event hall. They can be easily stacked and stored and come in a variety of colors and styles. Check out our most popular. Easily transport your stacking chairs from room to room or venue to venue. Our heavy-duty stacking chair dollies make it easy to set up your next event or use as a storage vehicle. Form and function go together with our selection of stackable chairs for restaurants, weddings and parties. Our metal stack chairs offer a chic, modern look, while our classic Chiavari stack chairs give a nod to timeless elegance. For a truly unique style, try our stackable ghost chairs that are also ideal for making a small space look larger. Stacking stools can complete the bar at any event or restaurant, while our outdoor selection can complete any patio or outdoor venue space. No matter what kind of audience you’re designing for, our chairs can help you achieve your vision. A corporate event is designed to bring people together, and getting the seating right is an essential component. Our banquet stack chairs are classic and comfortable, adding to the professionalism of any event. We offer a range of shapes, colors and fabrics, so you can get the look you need. Stackable chairs for churches offer the ability to bring together a community in worship. Shop a range of colors and widths, plus options with and without arms, to find the best seating solutions for your place of worship. If you regularly hand out print materials, a book rack underneath the seat is the perfect addition to serve your members. Stack chairs for churches have the comfort level of permanent seating with the bonus of easy transport, so you can quickly transform your space to adequately fit audiences of all sizes. Our stack chairs for schools accommodate children of all ages. 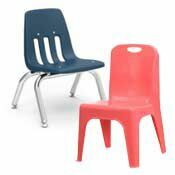 We offer preschool chairs for your youngest students that come in a variety of fun colors, shapes and sizes. 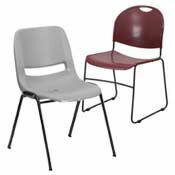 These quality chairs hold up in the most demanding learning environments. For older students, explore ergonomic options that help kids focus while remaining durable and easy to clean. There are also ultra-compact stacking chairs to help maximize space in smaller classrooms. Available in a variety of fabrics and colors, our personalized stacking chairs can help an event come to life. 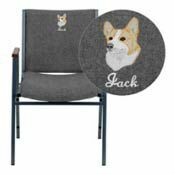 Add text and pictures with custom embroidery to any chair, from a bride and groom’s reception seats to a company logo for event branding. These made-to-order pieces can transform any ordinary space into a truly memorable one. The right dolly for your stacking chair’s size and style can make any set-up and tear-down hassle-free. Browse our selection to find the exact dolly you need for your new set of stackable chairs. Then, keep your seats looking pristine with our variety of chair covers and storage bags. These stackable chair accessories help keep your new chairs free of scuffs, scratches and dirt while they’re being stored or transported. Shop our full assortment of stackable chairs and accessories to find all the essentials you need for your upcoming events. Many of our products are in stock and ready to ship, making it easy to get the best stackable chairs delivered to you quickly and reliably.